Can you say that three times fast? When we went to the beach right before Christmas, we picked out a bunch of shells as we walked the beach and I put them in one of the pockets in my bag. Since then, I have been carrying the small shells around in my bag (no judging please), everyday hearing them rattle around as a reminder to clean out my bag. I took a piece of scrap wood we had in the garage and gave it a quick coat of stain. Then I used a clear drying glue to attach my shells in an S shape. I figure it can stand for Spring/Summer or our last name so it's super versatile! 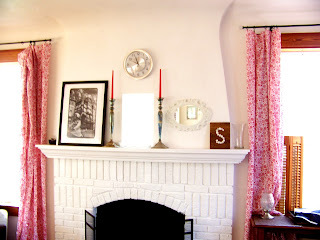 Right now it resides on our mantel but it may move around as we continue to do work on the house. Now I just need to work on cleaning part of cleaning out my bag and this project would be complete! How about you? Any impromptu art projects? Anybody else have a nasty bag that needs a good cleaning? What a fantastic idea. I have a whole bunch of sea shells that are sitting in a box that I collected the day my husband proposed at the beach. I should make something like this with them! Thanks for sharing at Manic Monday. 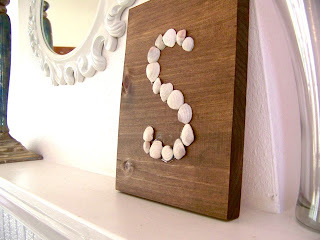 I like how you combined dark stained wood and shells! Great project- just my style! Visiting from Home Stories A to Z. Hope you'll share it at my party. It is a linked linky party, so post once and your project appears on 4 great blogs! Stop by- the party goes live on Monday at 9pm each week. LOVE how simple and classy this looks. I just adore anything beach themed! So fun and beachy! 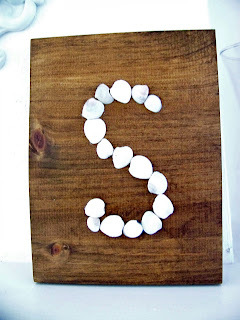 I have a beach theme in my bathroom and it makes me want to do something like that! Thanks for sharing! What a fantastic twist on all the button monograms! The shells look amazing againdt the dark wood! Thank you for sharing at Uncommon!